In his controversial and award-winning 2003 book Fields of Fire, Terry Copp offered a stunning reversal of accepted military history, challenging the conventional view that the Canadian contribution to the Battle of Normandy was a failure. 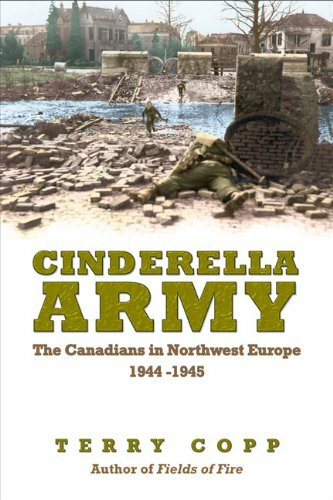 Cinderella Army continues the story of the operations carried out by the First Canadian Army in the last nine months of the war, and extends the argument developed in Fields of Fire that “the achievement of the Allied and especially the Canadian armies… has been greatly underrated while the effectiveness of the German army has been greatly exaggerated.” Copp supports this argument with research conducted on numerous trips to the battlefields of France, Belgium, Holland and Germany. His detailed knowledge of the battlefield terrain, along with contemporary maps and air photos, allows Copp to explore the defensive positions that Canadian soldiers were required to overcome, and to illustrate how impressive their achievements truly were. Infantrymen of The Stormont, Dundas and Glengarry Highlanders loading supplies aboard LCI(L) 252 of the 2nd Canadian (262nd RN) Flotilla during Exercise FABIUS III, Southampton, England, ca. 1 May 1944.